McDonald's is situated within easy reach on Great North Road, a 1.81 mile distance north from the centre of Baldock, in Radwell (next to A1 / London Road). This restaurant principally serves customers from the areas of Caldecote, Norton, Brook End, Newnham, Gravelpit Hill, Stotfold, Radwell and Hullockpit Hill. All through today (Thursday), it is open 24 hours. For further information about McDonald's Baldock, including the hours of business, local directions and contact details, please refer to the sections on this page. You will find McDonald's situated in a prime position not far from the crossroads of Newnham Road and Great North Road, in Radwell, Baldock. Only a 1 minute trip from A1 (M); a 4 minute drive from Station Road, Royston Road or Junction 10 (A507 Stotfold Shefford (Services)) of A1 (M); or a 8 minute drive time from Norton Road or Wrayfields. If you are planning your journey, enter SG7 5EX into your Sat Nav devices. Patrons can catch the train to Baldock Station (1.67 mi away). Easily get on the Govia Thameslink Railway line. In the neighbourhood you can come across Extramsa Baldock Services, St Mary's Church of England Academy, Stotfold Cemetery, All Saints Radwell, Saint Vincents Church and Stotfold Watermill Nature Reserve. 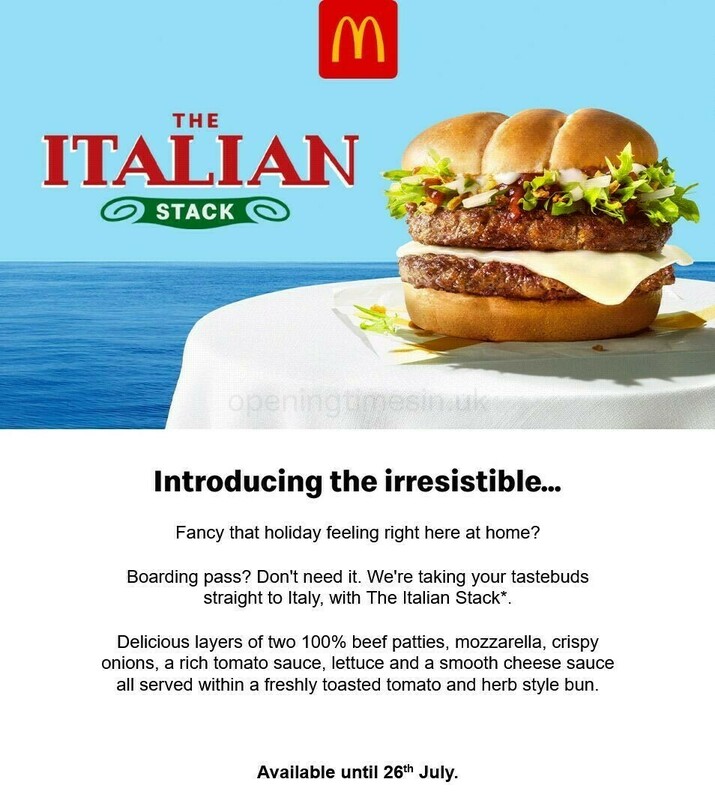 There is currently 1 McDonald's location open in Baldock, Hertfordshire. Click on this page for the full index of all McDonald's restaurants near Baldock. Please note: usual hours of operation for McDonald's in Baldock may be modified during UK national holidays. For the duration of 2019 these updates pertain to Xmas Day, New Year's Day, Easter Sunday or Early May Bank Holiday. We recommend that you go to the official homepage or phone the service line at 370 524 4622 to get additional details about McDonald's Baldock seasonal business hours. Help our team keep the information as up to date as possible. If you found any discrepancies or mistakes in the location description or working times for McDonald's in Baldock, please let us know by utilizing the report a problem form. Please critique McDonald's. Your feedback is appreciated! Write your review in the space provided below.